According to the USDA, about 23 million people have insufficient access to affordable and healthy food. This is the main reason why food-related ailments like cancer, diabetes, heart disease, obesity and Type 2 diabetes are presently on the rise. More people are very concerned with the kind of food they take in order to avoid all these diseases. This explains the reason why organically soil grown food is becoming more popular today. Modern consumers do not want to consume any food that is treated with dangerous chemicals. It is now common to find vegetables in supermarkets with labels stating that they were hydroponically grown. However, there exists a lot of confusion on how these type of vegetables fair against the traditionally grown types as far as nutrition is concerned. Here we seek to find an answer to the question: are hydroponic vegetables less nutritious? Are Hydroponic Vegetables Superior in Nutrition Compared to the Conventional Grown produce? Hydroponic vegetables are grown in controlled environments where all the necessary minerals needed for plant growth are provided through chemical fertilizers. Hydroponically grown plants have higher yields and growth rates compared to the conventionally grown plants. Proponents of the hydroponic way of growing crops assume that the great growing conditions provided to such plants will consequently lead to the production of healthy plants. However, these assumptions are farther from the truth as plant physiology proves otherwise. There are some critical areas that ought to be looked at in hydroponic farming in order to ensure that the resultant plants have the requisite nutritional value found in soil grown plants. One of the key determining factors on the nutrient content of vegetables grown hydroponically is the kind of nutrient solution that they will be grown in. It is possible to find hydroponically grown vegetables being as nutritious as those grown conventionally in soil. According to Marion Nestle, a New York University professor of nutrition, food studies, and public health, she has witnessed hydroponic producers testing their leafy greens for main nutrients. Marion added – results show that the nutrients are within the normal limits of such crops and at times posted even higher amounts. Generally, the nutritional value of the hydroponically grown vegetables appears to be the same as the one found in soil grown produce. Hydroponic growers have the capability of precisely controlling all the mineral levels within the plants, unlike their counterparts who use the traditional form. They have to fertilize their crops heavily to make up for the poor quality of soil. In an article published in the “Journal of Agricultural and Food Chemistry” back in 2003, studies had revealed that the carotenoid content in vegetables grown hydroponically was lower than those grown in the soil. These carotenoids like lutein and beta-carotene are plant compounds that are beneficial to the human health although they are not classified as either minerals or vitamins. It is hard to determine whether hydroponic vegetables are less nutritious by using experiments. It is possible for hydroponic growers to use diverse nutrient formulas when growing the crops and the environmental factors might also vary. Soil farmers also experience the same variations due to changing environmental conditions and soil health. For instance, the quality of water, humidity and temperature variations places a lot of stress on plants and this may alter their biochemical content despite the method being used to grow them. This has led to studies checking the nutritional value of crops grown conventionally and those grown using hydroponics posting no differences at all. There are some studies that have shown that crops grown in soil-less systems far better or at times worse than the ones grown in soil when their nutrient levels are being tested. This huge difference in results is attributed to the various variations that such crops experience when they are growing in the soil or in the hydro setup. A recent study conducted by Chenin Treftz and Stanley T. Omaye in 2015 sought to compare the difference in the nutritional quality of raspberries and strawberries grown hydroponically and in soil. The hydroponic solution used was the Flora series whereas the soil used was a mixture of Miracle-Gro potting soil and Nevada topsoil. The soil was re-fertilized using Miracle Grow fertilizer after every six weeks. The results from the study showed that anti-oxidant compounds like tocopherol, vitamin C, and the total polyphenolic compounds were higher in strawberries grown hydroponically compared to the ones grown in soil. The opposite was, however, the truth in raspberries. We have seen that soilless strawberries have the potential to provide a superior nutrient dense crop compared to soil grown plants. The soilless system has many environmental benefits to provide sustainable food in arid or urban regions. This, added with superior nutrition quality, may contribute significantly to environmental and public health issues that we are currently facing. – Nutrient Analysis of Soil and Soilless Strawberries and Raspberries Grown in a Greenhouse, 2015. An earlier study, Calcium, Iron, Potassium, Phosphorus, and Vitamin C Content of Organic and Hydroponic Tomatoes, 1998, returned results showing that tomato fruit grown in organic soil that was healthy had more Vitamin C compared to the same fruit grown hydroponically. Fruit grown on organic substrates contained significantly more Ca and vitamin C and less Fe than did fruit grown in hydroponic media. 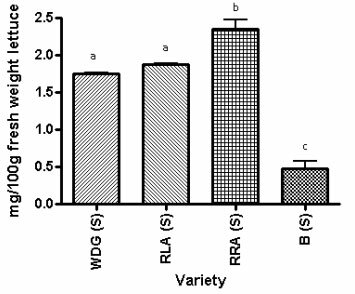 Phosphorus and K content did not differ between fruit from organic and hydroponic substrates. – Calcium, Iron, Potassium, Phosphorus, and Vitamin C Content of Organic and Hydroponic Tomatoes, 1998. In yet another study by Drew N. Buchanan and Stanley T. Omaye, 2013, results showed that lettuce grown hydroponically had more Vitamin C than the variety grown in soil. In this study, the soil type used had no reference other than it was a “non-commercial enriched with naturally composed materials” soil. These studies have also shown that the levels of glucose and fructose (sugar) were higher in the fruits grown in soil compared to those grown hydroponically. This explains why hydroponic produce is deemed as “less tasty” than the fruits grown in soil. Ascorbic Acid concentrations of various soil grown lettuces. Lettering abc indicates significance at p < 0.05, with Bonferroni used as a post-test for ANOVA. Waldmann’s Dark Green soil grown (WDG(S)); Red Lollo Antago soil grown (RLA(S)); Red Romaine Anna polis soil grown (RRA(S)); Butterleaf soil grown (B(S)). 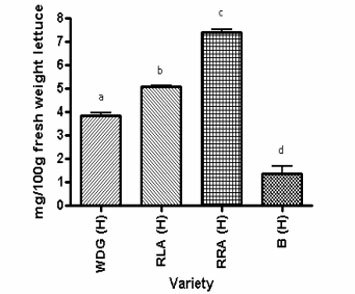 Ascorbic Acid concentrations of various hydroponically grown lettuces. Lettering abcd indicates significance at p < 0.05, with Bonferroni used as a post-test for ANOVA. Waldmann’s Dark Green hydroponically grown (WDG(H)); Red Lollo Antago hydropnically grown (RLA(H)); Red Romaine Anna polis hydroponically grown (RRA(H)); Butterleaf hydroponically grown (B(H)). Here we have prepared an in-depth review in order to find out the best hydroponics system. Lastly, in answering the question: are hydroponic vegetables less nutritious? It is important to note that there is a lot of evidence showing that plants evolve in order to up-regulate vigorous anti-oxidant compounds, especially during the stressful conditions. This assists them to make it through the harsh environmental conditions. Hydroponics may offer an advantage over the plants grown in soil as it can manipulate the water chemistry in the system to bring about a natural plant bioactives for healthy benefits. It is, therefore, wise to conclude that hydroponic produce can be superior to conventionally grown vegetables in both nutrition and taste, but this will be wholly dependent on the nutrient content found in the hydroponic solution. When a stronger hydroponic solution is used, a better product than the conventionally produced vegetables will be ensured.